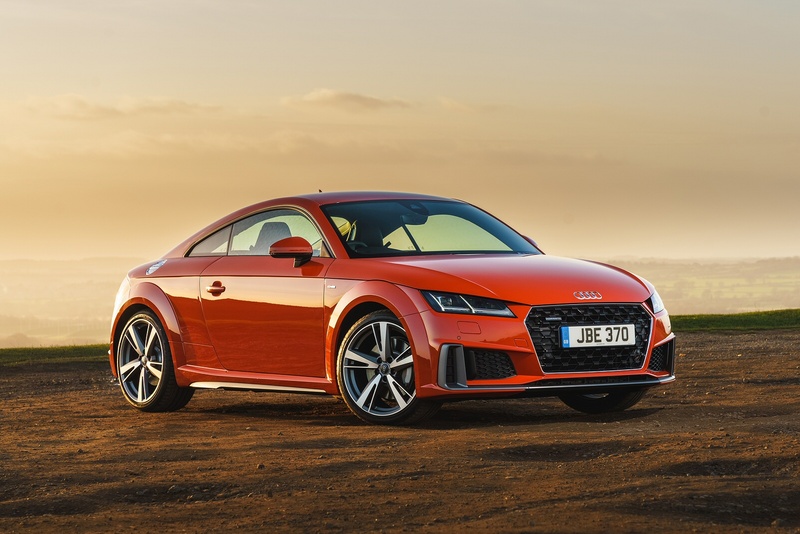 To celebrate twenty years of production, the third generation Audi TT coupe gets a useful package of improvements that include mild changes to the mechanicals, the cabin and the exterior. As before, it really makes the numbers when it comes to performance and efficiency. Choose from 2.0 or 2.5-litre petrol, front or quattro all-wheel drive. While it's true that ubiquity has somewhat dulled its impact, it's easy to overlook quite what a remarkable car that Audi TT was when it first appeared in 1998. Prior to the TT, Audi wasn't a company renowned for great design flair. It did safe and solid. Its most desirable sporting cars in the years leading up to the TT launch were estate models. The TT changed all that. It had an interior that felt like something from a motor show stand. It offered buyers an apparently irresistible combination of Audi build quality, styling that made everything else seem old and a clever quattro all-wheel drive chassis. The second generation model was probably a bit of a missed opportunity. After the extremity of the first car, everything seemed to be dialled back a couple of notches. The third generation design though, has proved to be much more desirable, fusing the driveability and slickness of the second gen version with the drama and flair of the first, while at the same time responding to shifting buyer behaviour. Now, it's been usefully updated. Audi's tinkered a little with the engine line-up in this revised MK3 model TT. The old entry-level petrol unit, a 180PS 1.8-litre TFSI powerplant, has now been replaced by a 2.0-litre TFSI powertrain with 197PS (badged '40 TFSI'), while the previous 230PS 2.0 TFSI engine gets a boost to 245PS (and new '45 TFSI' badging). There's now no longer a diesel option. The TTS retains its existing badging but gets a slight reduction in power (306PS, down from 310PS) but a little extra torque to compensate, so the rest to 62mph sprint figure (4.5s) is actually fractionally improved. 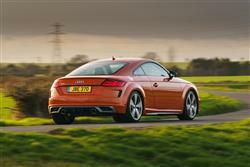 The flagship model remains the 400PS 2.5-litre five cylinder TT RS, which only comes with S tronic auto transmission and can get to 62mph in 3.7s. In conjunction with the 197PS 2.0 TFSI engine, customers have the choice of a six-speed manual gearbox or a seven-speed S tronic dual-clutch auto transmission. The 245PS unit is available with either the manual gearbox and front-wheel-drive - or with S tronic auto transmission and the multi-plate clutch-based quattro permanent all-wheel drive system. Both versions of the TTS feature quattro as standard. In both transmission types, the close-ratio lower gears enable powerful acceleration, while the wide ratio of each transmission's highest gear reduces the engine speed and with it fuel consumption. By networking quattro drive with the standard 'drive select' driving mode system, the TT driver can adjust the operating parameters of the all-wheel-drive system to suit his or her individual requirements. In "auto" mode, optimum traction and balanced driving dynamics are given priority. In "dynamic" mode, torque is distributed to the rear axle earlier and to a higher degree. In the drive select "efficiency" mode, the set-up can temporarily shut down the quattro system if conditions suit this. Audi's magnetic ride adaptive damper control system is fitted as standard to the TTS and is optional for all other versions. One thing's for sure. Even if you'd never seen this car before, you'd know it was an Audi TT. Some commentators have been a little disappointed in how safe Audi has played the exterior styling but this is still a very good looking little coupe with some lovely design touches. The fuel flap on the right side panel for example, is the classic race-style circle surrounded by socket screws, with no filler cap beneath the flap. This means that there is nothing to be unscrewed and the pump nozzle slots straight into the tank neck. As for styling changes to this enhanced model, well the main one is a revised design for the three-dimensional Singleframe radiator grille and larger side air inlets. Inside, the fascia is dominated by the Audi Virtual Cockpit, now featuring an additional sport display providing information on engine output, torque and g forces. Located directly behind the steering wheel, a 1440 x 540 pixel, 12.3-inch digital screen shows all information directly in front of the driver. Operated via the MMI Touch button, voice control and the multi-function steering wheel, the display can be switched between 'classic', with prominent speedometer and rev counter, or 'infotainment', which brings functions such as the navigation map or media to the fore. The round air vents - a classic TT feature - are reminiscent of jet engines with their turbine-like design. The vents also contain all the controls for the air conditioning system, including seat heating where applicable, plus temperature, direction, air distribution and air flow strength. As an option, they can also house small digital displays which show the chosen setting. A 2+2, the TTS Coupe gets a load area with a capacity of 305-litres, which can be extended by folding the rear seat backrests forwards. As before, you're probably going to need a budget in the £30,000 to £40,000 bracket for mainstream versions of this TT Coupe. 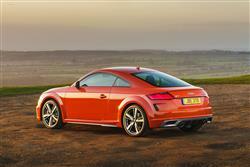 Push that up to about £42,000 for the TTS and about £53,000 for the TT RS. Rivals? 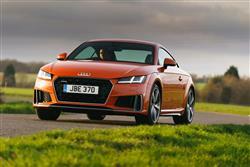 The base 2.0 TFSI TT has to face down hard chargers like comparable versions of the BMW 2 Series Coupe. The Porsche 718 Cayman is an obvious competitor for the Audi TTS, There are three trim levels in the mainstream range - 'Sport', 'S line' and 'Black Edition'. As for spec changes made to this revised version, well 'S line' and 'Black Edition' models get smart new wheels, respectively 19 and 20 inches in size. Inside, 'Sport' and 'S line' versions receive folding door mirrors and heated seats, and on top of these the 'S line' specification is also enhanced by the addition of even more supportive Super Sports Seats. The upgrade from there to Black Edition now brings the addition of Piano Black inlays and a new Chrome Slate Grey finish for selected interior elements. Options across the range include the advanced key for push-button starting, hill hold assist, high-beam assist, the LED interior lighting package, front seat heating and the storage and luggage compartment package. The connectivity package features the touchpad-based MMI touch system. At the top of the modular range is the 'MMI Navigation plus' set-up with its flash memory, two card readers, DVD drive, Bluetooth interface and voice control system. 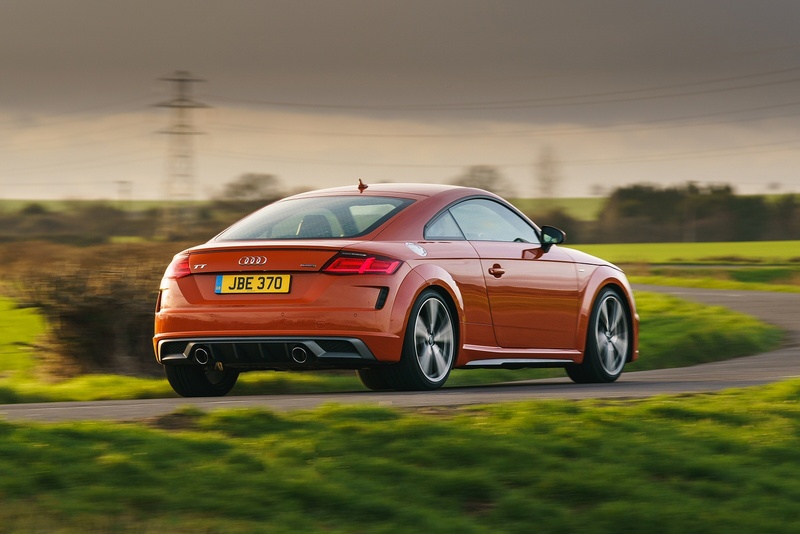 The TT has always been one of the most efficient sports coupes out there - and nothing's changed in that regard, though you can't have a diesel variant any more. 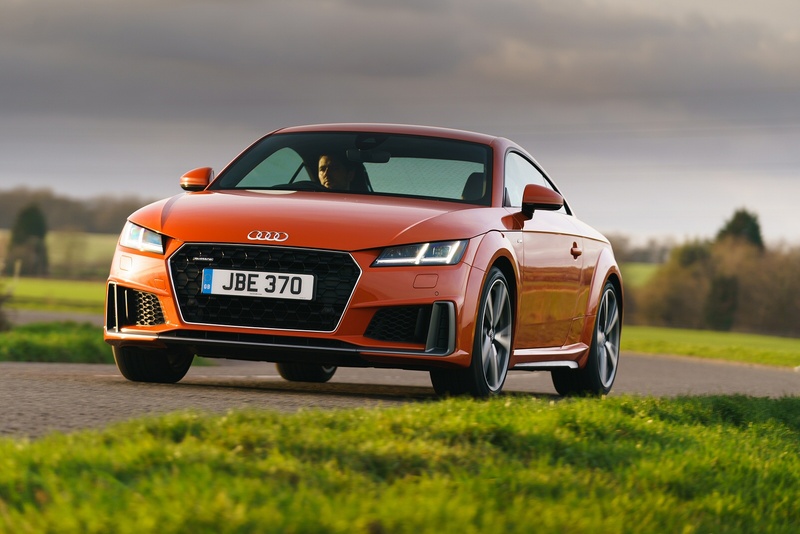 It certainly helps that all up, the TT 2.0 TFSI weighs just 1,230kg thanks to the extensive use of aluminium chassis members, body panels and suspension componentry. That 245PS 2.0 TFSI manual variant manages over 46mpg on the combined cycle and only just over 140g/km of CO2. The auto does even better. When the Audi drive select system is set to its 'efficiency' mode, the S tronic transmission decouples and 'freewheels' each time the driver takes his or her foot off the throttle pedal. The warranty covers you for unlimited mileage in the first two years of ownership and up to 60,000 miles in the third year and is transferable between owners. Pay more and that can be extended to a fourth year, again with unlimited miles in the first and second years but a more generous 75,000 mile allowance in years three and four. When it comes to maintenance, servicing your TT should be no more taxing than is the case with one of the company's lesser models. As usual with Audi, there's a choice of either a 'Fixed' or a 'Flexible' servicing regime, the choice between the two depending on the extent of your likely annual mileage. Residual values look set to be very beefy if previous TT models are anything to go by. If you’re looking for a new Audi TT 40 TFSI Sport 2dr S Tronic Petrol Coupe for sale, you’ve come to the right place. At Bristol Street Motors we don’t just have the best Audi TT 40 TFSI Sport 2dr S Tronic Petrol Coupe deals, we also offer friendly advice and help with all your enquiries to ensure your buying experience is a happy experience.